After twenty hours of airplane and three hours of bus ride, we finally arrived in Kampong Thom. Kampong Thom is a province located at the central point of the Kingdom of Cambodia. 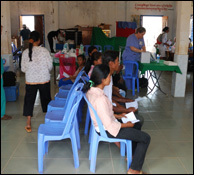 We were there for two weeks in February of 2010 visiting various districts of Kamphong Thom. We spent 10 days in ten different communities, setting up our "clinic" in a pastor's house, churches, health centers, and with the first day under the tree. Our team consisted of 18 members including dentists, family physicians, physician assistants, nurses, pharmacists, and logistics. We had a privilege of serving the most needy area in the country due to Typhoon Ketsana which they have not recovered from yet. Our group's main focus was to reach out to those who rarely, if ever, are treated for medical or dental health concerns. Amazingly, we averaged 350 people each day. Pharmacy was a quite busy place. We counted over 100,000 pills and filled over 7,000 prescriptions. We were all grateful for bi-lingual (English/Khmer) generic labels that we prepared in advance. Each day we had to pack-up and bring our supplies with us because the location of our site was different. The children were wonderful to work with and they did not seem reserved at all. Some of them came to see a doctor without any supervision. They waited patiently in line and did not even flinch when dentists were going to pull their teeth. This was my first trip to Cambodia and the pictures I have seen just did not do it justice. The photographs of Angkor Wat, a spectacular fusion of symbolism, symmetry and spirituality, were breathtaking. Despite this beautiful backdrop, life is no picnic for the average Cambodian. 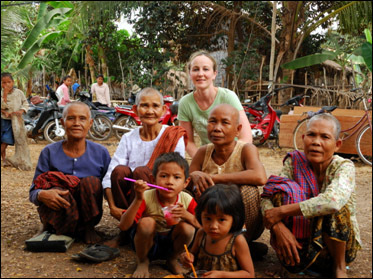 Many of the Cambodian villages had no electricity or running water. According to United Nations Development Programme about 35% of Cambodians live below the national poverty line of $0.45 per day. Thirty six percent of children under 5 years of age are moderately or severely under weight. Those people do not have much by world's standards, but they have hope and dignity. The people we met were generous and grateful. We were all impressed by their compassion and willingness to help each other and care for themselves. We received much more than we gave. Our lives are forever changed.